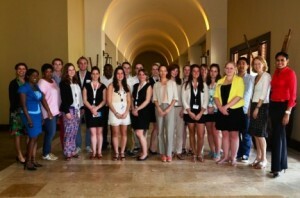 WILLEMSTAD - Dutch MBO students undergoing training in Tourism paid a visit to Curacao. During the 'Reiswerk Topclass' students have been spending time with various players in the tourism sector. The project was organized by the Curacao Tourist Board Europe (CTBE). The Dutch Association of Travel Enterprises (ANVR) has also contributed to the project. The students’ trip included a visit to the Curaçao Tourist Board (CTB), Ocean Encounters, Santa Barbara Beach & Golf Resort, and Dolphin Academy at the Curacao Lions Dive & Beach Resort. They have also met with some PR and marketing professionals in the industry.